After leaving Scotland, the couple managed to continue their relationship long distance, and it was five years before they eventually moved closer together ("Paul was a weekend boyfriend" says Laura). The couple got engaged by a lake in Northumberland. It wasn't Paul's original plan, he actually intended to ask Laura to marry him on the bridges of Newcastle where they lived, but he chickened out last minute when he saw how many people were around. 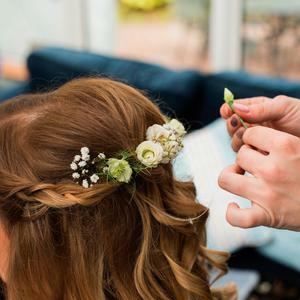 When it came to planning the wedding Laura knew one thing about her big day - and that was that she wanted to get ready in her family home, so the couple had to find a venue close by her house in Antrim. They wanted to plan a relaxed and fun day for guests, with a vintage-inspired, garden-party feel as a theme. They also wanted music to feature heavily in their day, which they did by creating festival-inspired playlists, and the help of friends, and the band The Bentley Boys. 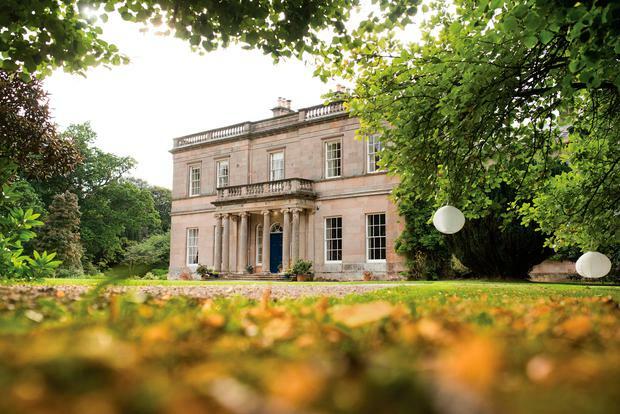 The couple tied the knot in the magical Drenagh House. Their photos were by Mark Barton. 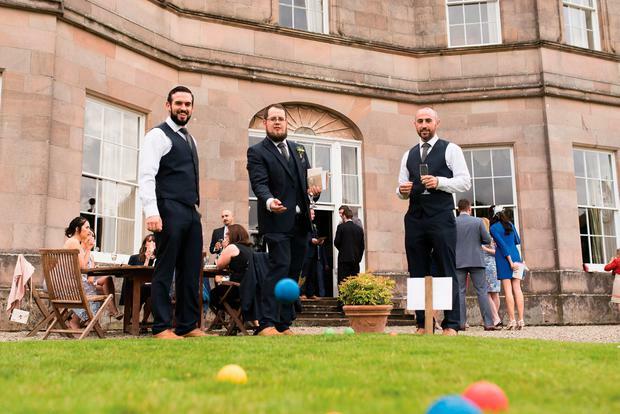 The couple chose Drenagh House in Antrim for their ceremony and reception, initially because it was close to Laura's house - where she wanted to get ready in the morning. "We knew we wanted something different and getting married in the Moon Garden ticked that box," said the bride. "It was a beautiful place to get married. We also liked the marquee as we could put our own stamp on the décor and the house itself is stunning. It was in the perfect location for me to get ready at my childhood home which was what I wanted and on the North Coast where I spent so much time as a child. We went to Downhill beach the next day." 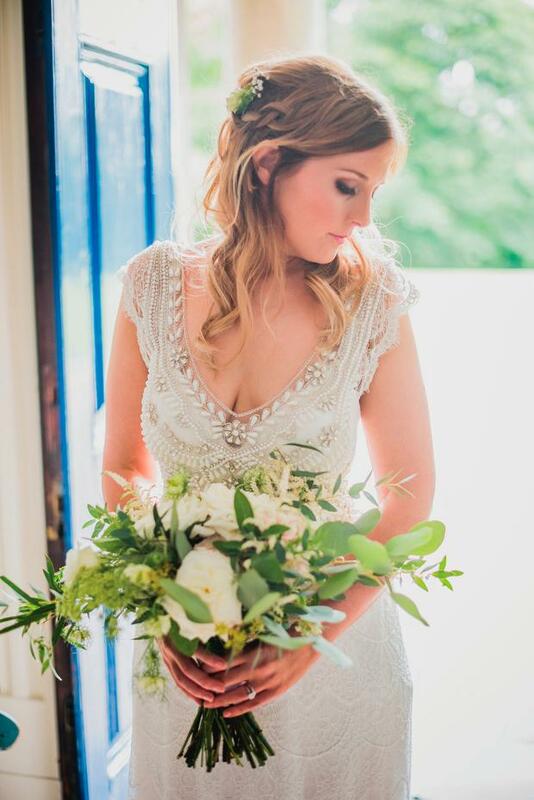 Laura bought her dress from Ivory and Pearl in Comber, County Down. Her style was Coco (lace) from Anna Campbell's Spirit collection. "I knew exactly what style I wanted from my dress and knew the types of dresses that would suit my shape," said Laura. 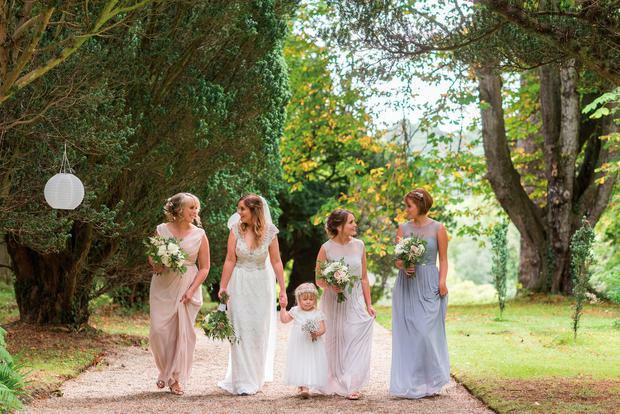 "I wanted a very relaxed vintage style dress and Anna Campbell's dresses were just beautiful. It was one of the first dresses I tried on and went back to visit it three times before buying it. This dress could also be customised to your taste with different fabrics and colours which makes it very individualised. I enjoyed the wedding dress shopping but with so many beautiful dresses it can be hard to pick one!" The bridesmaids dresses were from Wedded Bliss, Portglenone, County Antrim and the flowergirl's dress was John Rocha for Debenhams. While the couple found it difficult to plan a wedding from abroad, luckily their supportive family and friends lent a hand where they could. 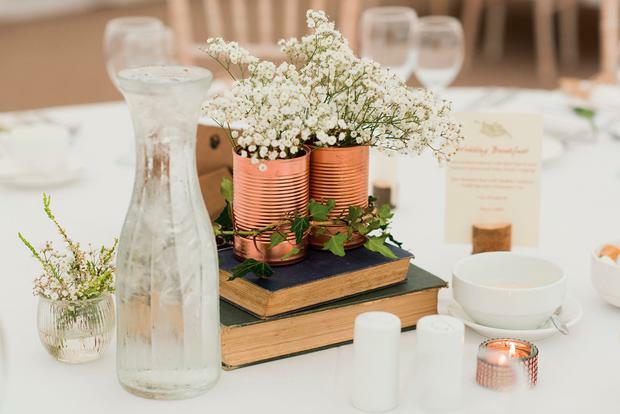 Laura's dad made the stationery, including the invites, order of services, table names, menus all featuring rosemary and copper. 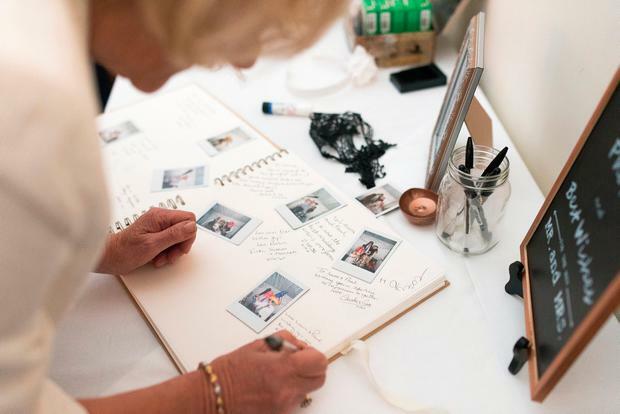 "The wedding was a very homemade wedding with particular thanks to my parents and their artistic skills," said Laura. "We chose foliage greens such as rosemary, trees and ivy, unstructured freeform flowers, pastels and copper tones. " 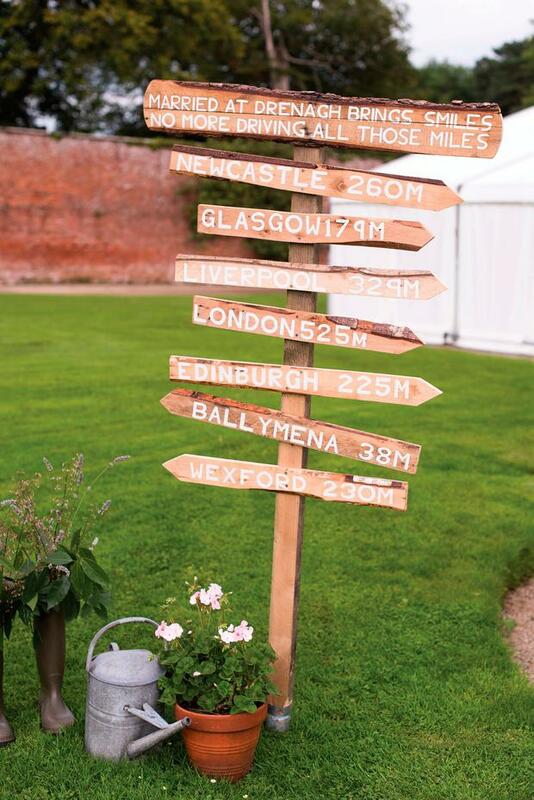 "We wanted lots of quirky signs around the venue. We bought many of these from pound stores, local shops and supermarkets. My dad also made us quite a few including the pick a seat not a side sign and a sign at the front of the marquee which shows all the places we both lived during our 5 year long distance relationship. 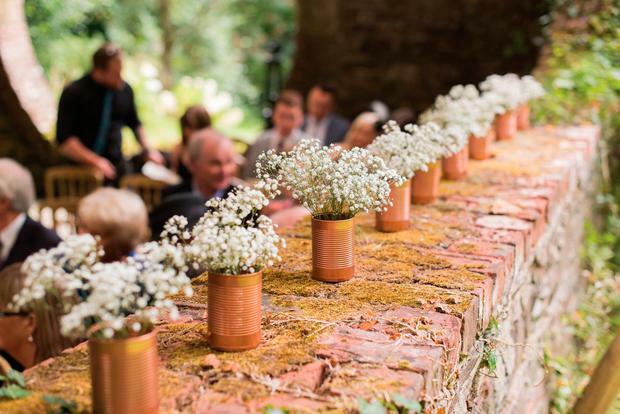 We had copper sprayed tin cans in the Moon Garden (of Drenagh House) filled with gypsolphelia which later formed some of the centerpieces in the marquee. We had to collect a lot of tins!" They used copper-sprayed IKEA picture frames with famous movie love quotes and placed them throughout the marquee. 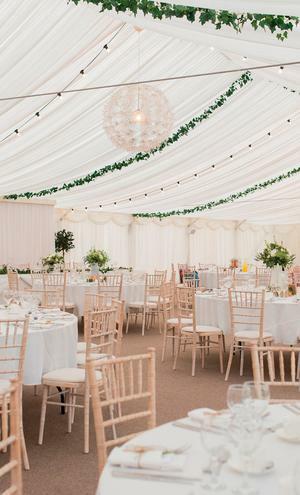 Their local butcher supplied wooden crates which the couple used as a feature in our marquee. They filled them with pot plants from Laura's mum's garden and old beer bottles which they collected. "We used old medicine bottles my sister (who is a doctor) got for us to put flowers in round the venue," added Laura. "A family friend supplied old suitcases as props. We both love to travel so we had famous travel love film quotes on these and a trellis with Polaroid style pictures of all the places we had visited together beside it. These were printed from LaLaLab website." The couple's tableplan was made by Laura's dad using an old frame covered in Burlap with ivy from their garden wired throug. "The tables were named after places we visited together in Edinburgh- mainly pubs! Our card box was made from an old suitcase which I covered the inside with black and white photos of us and fabric from The Works. We also had personal wedding photos there from family. 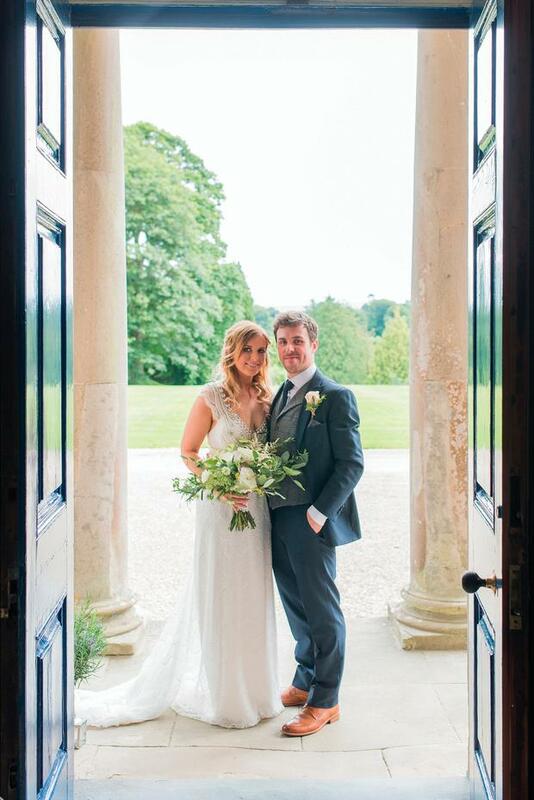 "We had ivy running through the ceiling of the roof put up by the venues wedding supplier. She also put up festoon lighting outside and we put up multicoloured bunting that was made from my sister’s wedding outside to give a relaxed festival vibe outside. We also had straw bales from a local farmer covered in blankets outside to fit with this. The couple had a DIY photobooth at the venue, and most of the props were borrowed or bought from ebay and Poundland. They bought a Polaroid camera and everyone had fun taking their own photos. They used these are their guest book, which they bought from Paperchase. "Our cake was made by my sister and sat on a wooden log supplied by the florist who added baby's breath to it. There was a sprayed copper topper from ebay." 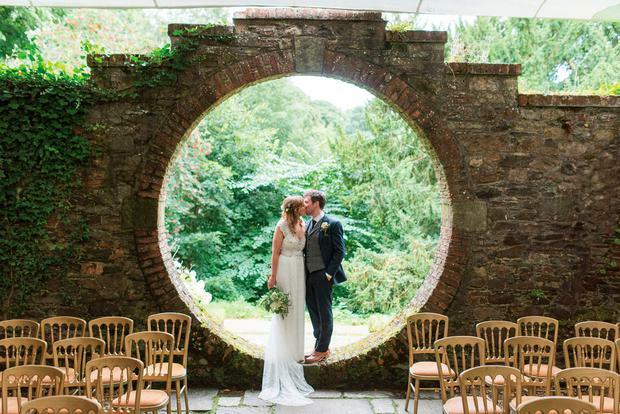 The couple had a Church of Ireland ceremony in the Moon Garden at Drenagh House. Guests did readings from Winnie the Pooh, Les Miserables and Paul's sister sang the Irish Prayer. Laura walked down the aisle to Love Actually - Glasgow theme and the couple had Gavin James ‘Book of Love’ and Passengers ‘And I Love Her’. "We both love music so this helped make the wedding very personal," Laura added. "Our favourite part of the day was seeing all our friends and family there to celebrate with us together," said Laura. 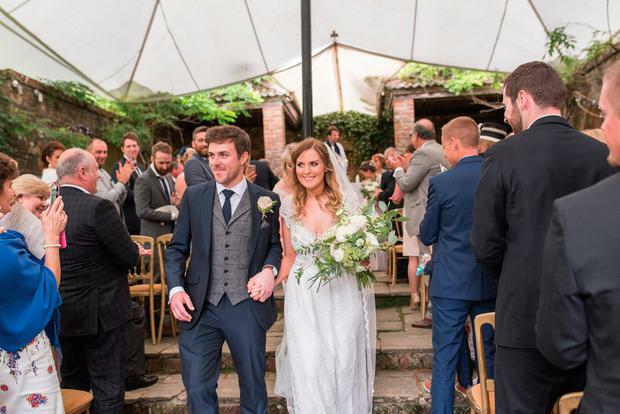 "We have family and friends from all over the UK and Ireland so we were touched that they could all be there to share our day. The first dance was pretty fun too, Paul got to choose the song- he chose Raspberry Beret! I even bought him a beret which he got the morning of the wedding to wear during the first dance!" The couple chose salmon for starters followed by roast beef and a trio of desserts. as their meal They served traybakes and shortbread made by Laura's nanny at their drinks reception. "Our dinner menu was quite traditional to cater for all our guests’ tastes despite Paul and I being total foodies," said Laura. 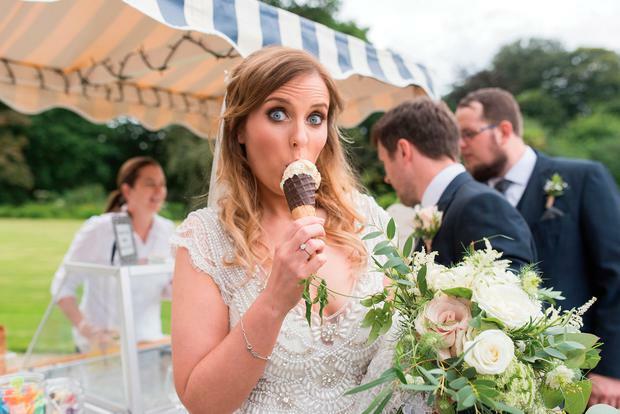 "We had an ice-cream cart from Heavenly Temptations who use Maud's ice-cream. This was my favourite ice-cream as a child and Pauls favourite food. 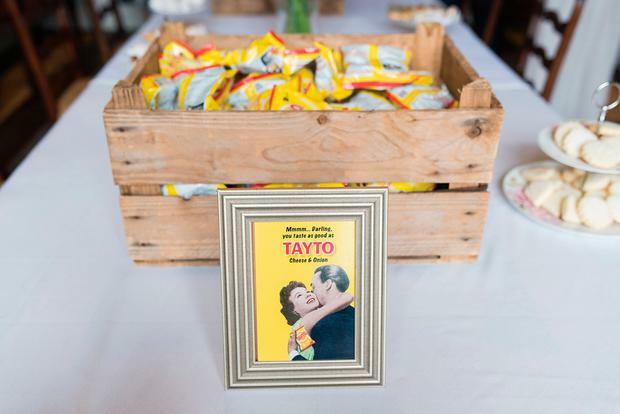 We also had Tayto crisps - one crate of Northern Irish cheese and onion and the other Southern Irish. A great debate on which one tastes better!" "We had floral arrangements from our florist as some of the centerpieces," said Laura, "these were placed into mismatched jugs some of which were sprayed cream and bought from Dunelm. We put these on top of old books supplied by family to help the vintage theme." They had copper tea lights and place their table names in copper painted frames and cream frames which they source in ebay and poundland. "The napkins were from my sister’s wedding" Laura added, "and the local fruit and veg shop supplied rosemary sprigs to add greenery. The nametags were bought from ebay and added another vintage edge to the décor in brown paper. Our favours were a donation to TinyLife charity as I have three premature nephews and we also had lego brick chocolate as Paul is an engineer and loved lego." 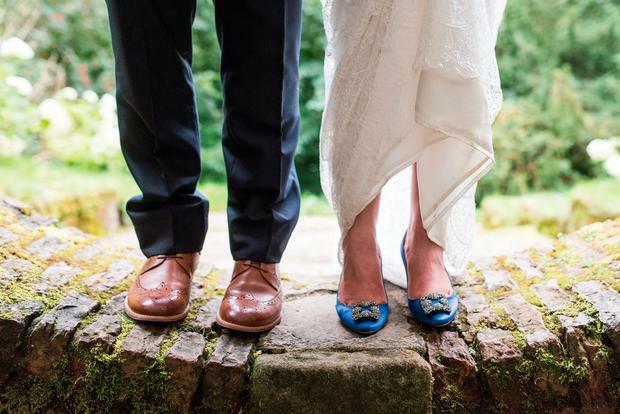 "Our advice for all couples is to enjoy the day and take in every minute of it as it goes so fast," said Laura. " Any stress from the planning is truly worth it as it will be the best day of your lives. Make sure you do a little bit of research before meeting suppliers that they will cater for what you want as this will save you time in the long run. lso rope in all your friends and family who are happy to help as you’ll be surprised what hidden talents they may have." Laura and Paul spent just under three weeks in Singapore and Indonesia for their honeymoon, staying in the Marina Bay Sands in Singapore (which Laura said had amazing food) before travelling to Java in Indonesia to stay in the Hyatt Regency in Yogyakarta, - "We then travelled to Ubud, Bali staying in a villa at the beautiful Royal Pita Mahi another fab place to stay. We visited temples, monkey gardens, rice fields, local villages, amazing restaurants etc. and then moved down to our final stay at Jimbaran Bay staying at the incredible villas at the Ayana Resort and Spa. We relaxed here using the private beach, top spa facilities and saw some local dancing at Uluwatu temple at sunset." Would you like to see your big day featured on THEVOW.ie? We want to hear from you! Simply send your names, your wedding date, your wedding location and the name of your photographer or your wedding videos to Editor (@) thevow.ie and we'll get back to you!